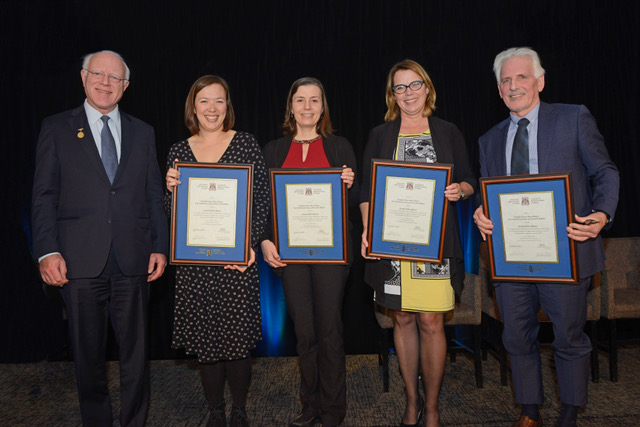 The Guelph Family Health Team is proud to announce the recipients of a joint Award of Excellence from the Ontario College of Family Physicians. The Award of Excellence recognizes outstanding contributions in a specific area pertaining to the specialty of family medicine: patient care, community service, hospital or health-care institutions, College activities (CFPC or OCFP), teaching, research or other elements of the academic discipline of family medicine. Drs. Joan Chan and Douglas Friars of the Guelph Family Health Team, Dorothy Bakker from University of Guelph Student Health Services and Risa Adams representing Guelph Community Health Centre were recognized for creating and leading the Act As One Service (AAOS) initiative. This approach to service strengthens collaboration within our local health system and addresses gaps in care and so that Guelph and area residents have to the mental health and addictions care they need and deserve. The recipients received their joint Award of Excellence at the 2018 OCFP President’s Installation and Awards Ceremony on Wednesday, November 14th in Toronto.